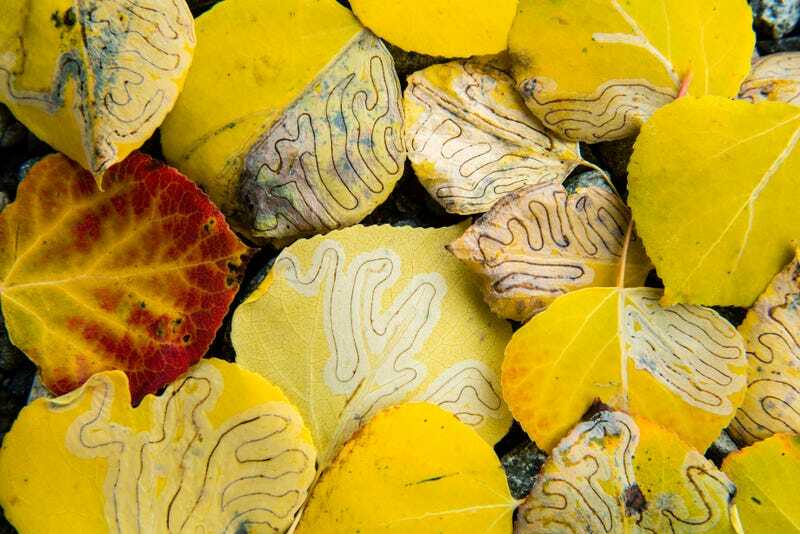 Nature hides patterns everywhere. The key is knowing where to look. The Royal Society of Biology’s 2018 photography competition asked participants to seek out those patterns in nature. The winners, announced Thursday, delivered. The two award-winning photos show the hypnotic brown and black lines left by larvae trails on Yukon leaves, and a leopard gecko’s hexagonal scale patterns up close. The Royal Society of Biology’s photography competition dates back to 2013, and every year features a new theme. Last Year’s The Hidden World zoomed in on parts of nature we can’t always see, like the heart of a mouse embryo. Five years ago, the inaugural Feeding Life celebrated animals eating. The society received more than 2,500 photos from over 900 entrants for this year’s competition, Patterns in Nature, which bestowed a Photographer of the Year and Young Photographer of the Year award. Jack Olive, 17, is the young gun whose shot of a leopard gecko—with patterns visible in both its scales and its eyes—got him first place. With the gecko looking straight into the lens, it couldn’t have been an easy shot to capture. Adult winner Roberto Bueno, on the other hand, went for fall leaves marked by the meals of larvae. The 12 shortlist winners captured some marvelous moments, as well: a 10-year-old’s fascination with a starfish plant, a zebra and its reflection, the twinkling wings of a dragonfly, and even some crystalized citric acid. Take a look at the images for yourself in all their glory.